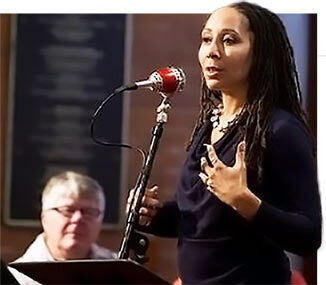 Monica A. Coleman teaches a faith that liberates. She is a renowned leader in process theology and liberation theologies, Coleman speaks throughout the U.S. and international settings. In every presentation, she educates, cultivates and empowers people of faith and purpose to connect their beliefs with both their personal experiences and social action. Coleman speaks on many of the issues that religious leaders avoid: sexual and domestic violence, mental health, postmodern belief, religious diversity. She offers key insights about these issues with pragmatic solutions for individuals and communities. At colleges, churches, foundation meetings or leadership retreats, Coleman speaks with sincerity and depth of knowledge. She re-imagines scripture giving fresh perspectives on well-known texts to apply to today’s world. She brings life to statistics and data about violence and mental health through unforgettable thick descriptions of real life. She explains how philosophy, narrative and culture intersect to offer new models for understanding faith in today’s society. She offers exercises and practices for taking the next step forward.